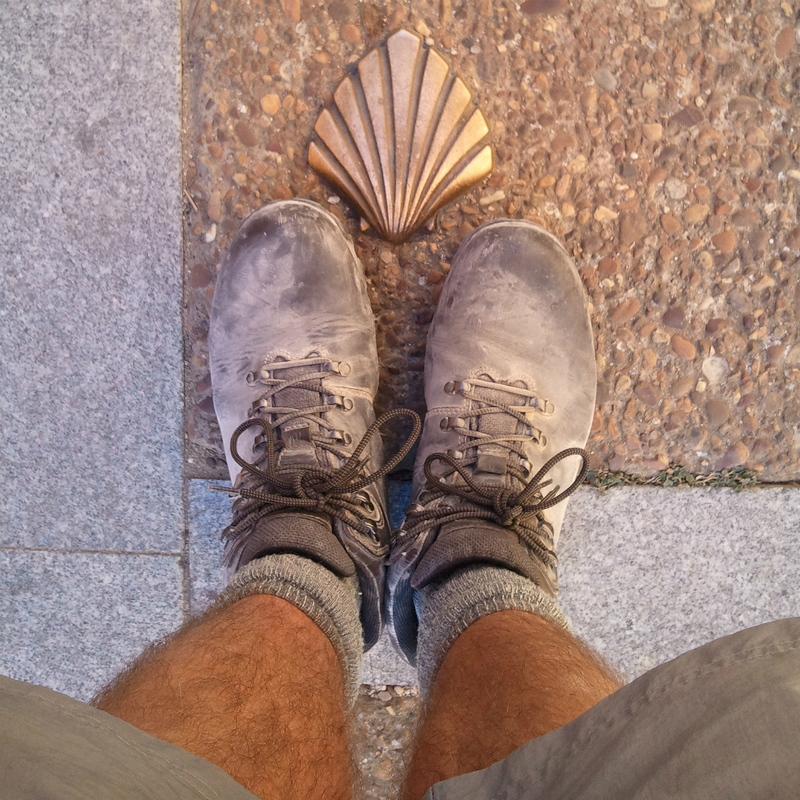 In September 2012 I walked the Camino de Santiago – a 525 mile hike across Northern Spain from Saint-Jean-Pied-de-Port on the French side of the Pyrenees to Santiago de Compostela in North West Spain. This trip was the reason I purchased the Brasher Hillwalker GTX hiking boots that I am going to review in this blog post. Now I don’t normally go by a manufacturers description when buying hiking gear as I prefer to ask my friends on Twitter, and other social networks, their opinions. After all, these folk (and I include some of you reading this) are out there hiking in all conditions in all sorts of gear, so who better to ask right? And whilst I did indeed ask my followers and friends their opinion, I was struck by Brasher’s assertions that – “The primary functions of the Hillwalker GTX is to provide long term comfort, ease the stresses and strains after long walks and hikes, and be tough enough to put up with the conditions it faces.”and “there is an understanding that these will be worn over long periods of time”. I would be testing these assertions when hiking an average 22 miles a day over 24 consecutive days on my Camino de Santiago! So after 1200 miles do I concur with Brasher? Well I have worn the Brasher Hillwalker GTX boots almost daily since I purchased them in July 2012 – 8 months ago at the time of writing this – and Brasher’s understanding that they would be “worn over long periods of time” was certainly true in my case! As for the “primary functions of the Hillwalker GTX”? I have to say they certainly fulfilled their functions too. From first trying them on at GoOutdoors store in Oxford, where I purchased the boots at a sale price of £59.95, to the present day, the Hillwalker GTX’s have always provided a comfortable fit. 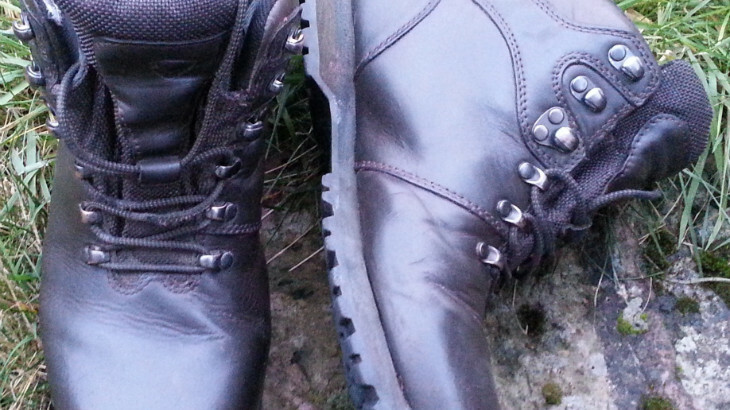 There was none of the ‘wearing in’ problems usually associated with new boots (and leather boots can be notorious for this)- the Hillwalker GTX’s were comfortable and flexible from the moment I tried them on. Now I have a typical Englishman’s broad feet and am a UK size 9 (US size 10, EU size 43, Japanese size 28) and find that I fluctuate between a size 9 and size 10 depending on manufacture. However, Brasher offer half size footware and cater for the broader foot so I found a size 91/2 boot to be a perfect fit. The boots, whilst not the lightest in the Brasher range, are certainly not heavy and I have never experienced any aches in the the talocrural joint that sometimes occurs when wearing heavier boots for long periods of time. The low ankle fit of the boot also helped prevent ankle rubbing and the only blister I have experienced when wearing the boots was caused by a loose fitting sock and not the boots themselves. 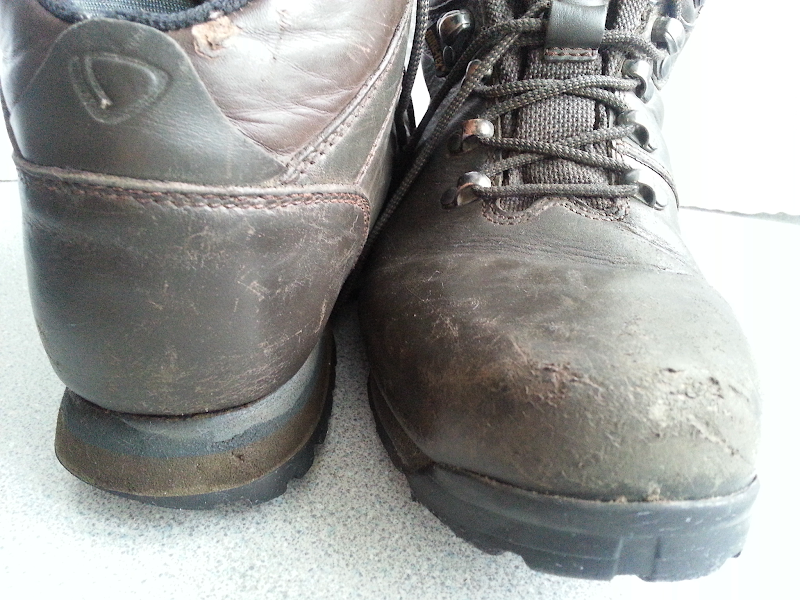 As you can see from the images above, apart from a few scuffs, a little wear at the rear ankle area and some wear on the soles, the Hillwalker GTX’s are still in good condition after 8 months and 1200 miles. 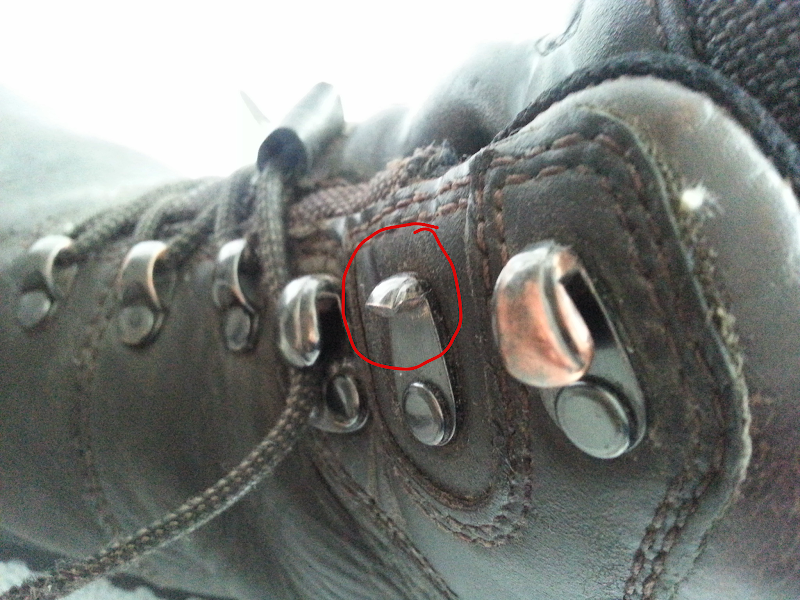 The only damage other than this normal wear and tear was to an eyelet on the inside of the right boot (see image above right). 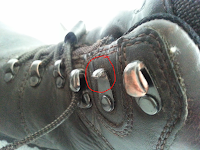 I can’t remember when this happened – probably when in a haste to tighten up my laces, but it doesn’t impede tying up the boot laces – which is the important thing. The shock absorbing EVA midsole certainly works at helping cushion minor lumps and bumps on the trail; in fact the only areas these boots become uncomfortable is on flat, even, hard ground such as tarmac or concrete where the supplied inner soles are just too thin to be of any use. I purchased third party inners which I slip into the boots when walking on such unyielding terrain. In fairness to Brasher however, the boots do work well on soft terrain, defined paths and gradual inclines such as coastal walks and forest trails and I would extend that range to include hill and valley walks too. The boots are great in boggy areas and the soles provide a surprising grip on damp/wet rocky paths. There is enough flexibility in the leather to ‘tip-toe’ whilst the boots offer good rigidity in the heel and ankle areas. The boots are lined with GORE-TEX® Extended Comfort Footwear which is breathable and suitable for warmer climates and yet these boots perform well in colder conditions too. Certainly in the hot climate of Spain my feet never overheated and when hiking in snow wearing good winter socks my feet didn’t freeze either. The leather used is of good quality and with regular care (cleaning after a hike and treating with leather conditioning cream and/or a wax polish such as Granger’s G-WAX) the uppers will last a long time. As for the soles, well I find the Vibram® soles offer good all round grip and are hard wearing too. The stitching of the leather is tight and strong and I haven’t suffered any fraying or undoing which is a sign of good craftsmanship. Likewise the soles are very strongly glued to the uppers and are still very much firmly attached – with canvas boots I find the soles part company with the uppers sooner than I would expect! 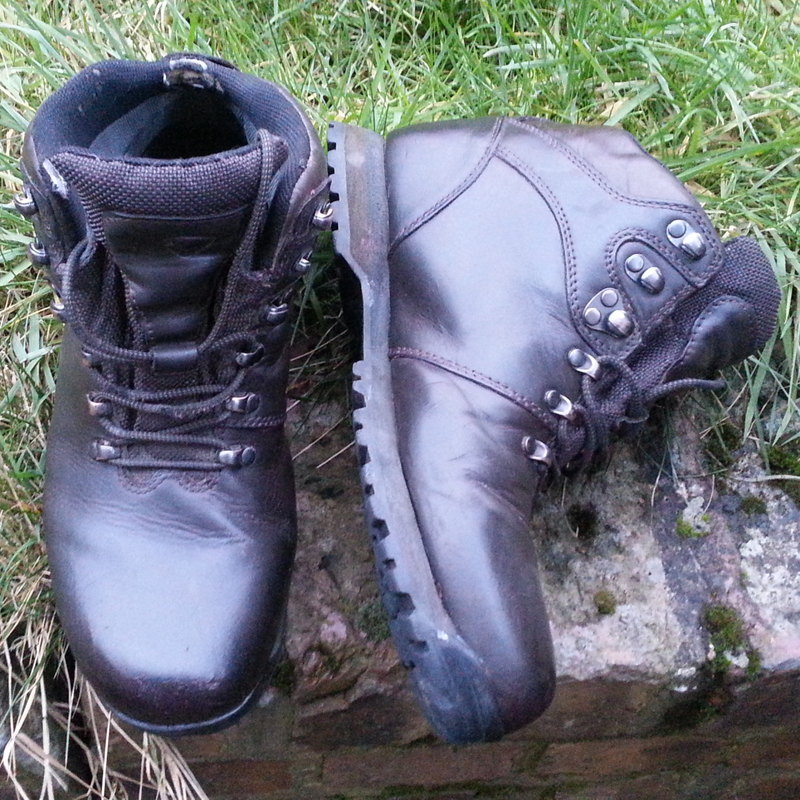 These are my first ‘Brasher’s’ and after some heavy use over multiple days I am very happy with the Hillwalker GTX. I have walked through 6 inch snow for two days, hiked in 35+ degree temperatures for 24 days straight and waded streams and thick bogs and throughout all of this my feet stayed warm, but not hot, dry and comfortable and I never once felt like I had to remove the boots immediately after a long days hike because of aching feet.If you are looking for a light, comfortable, durable leather boot and don’t want to pay through the nose for them then I can recommend the Brasher Hillwalker GTX. If the Hillwalker II GTX follow in their footsteps then perhaps you might stretch your budget to those instead. But for now I am getting ready to walk the Pennine Way in April with my good friend Dean Read and will be wearing my Brasher Hillwalker GTX boots on another epic hike. Below is the route I took for my Camino de Santiago mentioned in this review. I purchased the Brasher Hillwalker GTX mentioned in this review with my own money and I am in no way endorsed or sponsored by Brasher. All opinions are mine based solely on my experiences. 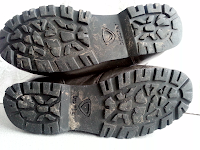 Feature, Gear Reviews Boots, Brasher, Canino, Hiking, leather, Review, Spain, walking. permalink.